Corn & Butter Bean Casserole-A Fave! 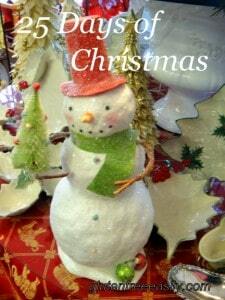 It’s week 4 of our Gluten-Free Holiday event and the continuation of my 25 Days of Christmas! Diane (The W.H.O.L.E. Gang) is hosting A Gluten-Free Holiday with Christmas and Hanukkah Favorites—entrees and side dishes. She is sharing Chipolatas. Never heard of Chipolatas? I hadn’t either, but they’re made of one of Diane’s very favorite “food groups.” (Hint: It’s a four-letter word that rhymes with fork.) Check Diane’s Chipolatas out here, plus share your favorite recipe in this category and enter the current cookbook/book giveaway. See a listing below of all the great ones you can win (giveaway runs through Wednesday, December 8). One copy of Gluten-Free Girl : How I Found the Food That Loves Me Back … and You Can Too by Shauna James Ahern. One copy of Gluten-Free Girl and the Chef by Shauna James Ahern and Daniel Ahern. And, three e-book trios (includes one copy of Sweet Freedom, one copy of Desserts without Compromise, one copy of Anti-Candida Feast Book) from Ricki Heller. Now let’s get to the recipe I’m sharing for this week’s event. As I stated when I shared my “Candy” Carrot Coins recipe, veggies often get the short end of the stick when it comes to holiday meals. So I do try to make up for that as much as possible by including an irresistible salad and a vegetable dish that does not involve potatoes. Don’t get me wrong; I love potatoes, but the latter always gets the glory for holiday meals, although there are other tasty choices. Years ago (decades, actually) when flipping through a cookbook that belonged to my future mother-in-law, I came across this recipe for Corn and Butter Bean Casserole. 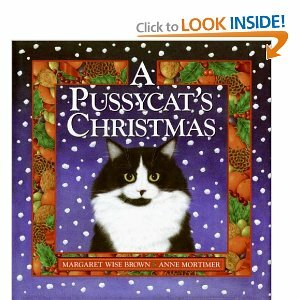 It’s become a family favorite, even after several adaptations over the years. Even my picky brother in law eats this casserole and enjoys it. After the first time he sampled it, he complimented me on the recipe, admitting that he was surprised by how good it tasted. It’s a dish that’s creamy and flavorful without being too heavy or sleep inducing—an often common factor for holiday casseroles. Still, this recipe serves many as a small serving is really all one needs. Adapted from a recipe from one of my mother-in-law's cookbooks; exact source is unknown. In a double boiler, make sauce of butter, flour, and milk. Stir fairly often until mixture, thickens into a sauce (about 15 minutes). Add onion and cheese (if used). Layer 2-quart casserole dish as follows (I use a Pyrex glass loaf pan), half of shoepeg corn, half of beans, and half of sauce. Repeat. Top with your crunchy topping of choice; see notes. Bake at 350 degrees for about 20 minutes. Increase oven temperature to 375 degrees for another 5 minutes or so if additional browning of casserole top is needed. 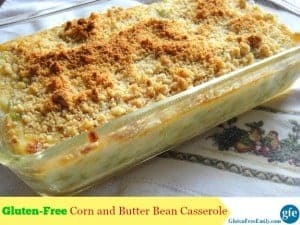 Beans: I used 1 1/2 cups of baby lima beans when making the casserole shown in the photo. Corn: Shoepeg corn is sweet and mild, but if you can't find it you can use any corn. I hate the fact that the canned corn now contains sugar, but since you drain the liquid, I figure for this one recipe, it can't be too bad for you. The original recipe called for a 17-ounce can of corn; the can is now 11 ounces in my store! That's definitely a sign of the times, but 11 ounces still is plenty. Cheese: If you omit the cheese, you will probably need to reduce your milk amount slightly to ensure that your sauce thickens enough. Flour: Sweet rice flour is great for thickening (e.g., gravy) and could be probably be used in place of the gluten-free flour mix. I used my standard gluten-free flour mix of 3 parts Asian white rice flour and 2 parts cornstarch. (I make this flour mix in large batches and measure out as I need it.) Topping: The original recipe called for a topping of Pepperidge Farm stuffing mixed with 1 to 1 ½ sticks of butter. Obviously, that’s not gluten free, or even a particularly healthy topping. Usually I mix almond flour with a little olive oil or butter, broil about a minute (literally) until brown, and then sprinkle over the top of the casserole. You can skip the broiling step, but I like the browned look it adds. If you make stuffing a day ahead of your meal, you can reserve some for topping this casserole. Other topping possibilities are gluten-free bread crumbs or crushed gluten-free crackers. Crushed potato chips or tortilla chips can also be used. Sometimes choosing one of those latter toppings can make this recipe more appealing to children. Onion: You can omit the onion for those who hate them, but the small amount of onion really makes this recipe in my opinion. And, even non-onion-loving Son enjoys this recipe. Non GF: Last, as always, if you are not eating gluten free, you can use any flour you choose. I'd still recommend a lighter, finer flour. Wow is that comfort food or what! Thank you for sharing it with a Gluten-Free Holiday! I love a good casserole, but you won’t catch me putting lima beans in anything! lol! I’m sure it’s good with butter beans. Oh, that looks wonderful! Warm, creamy, cheesy, with a crunchy topping! 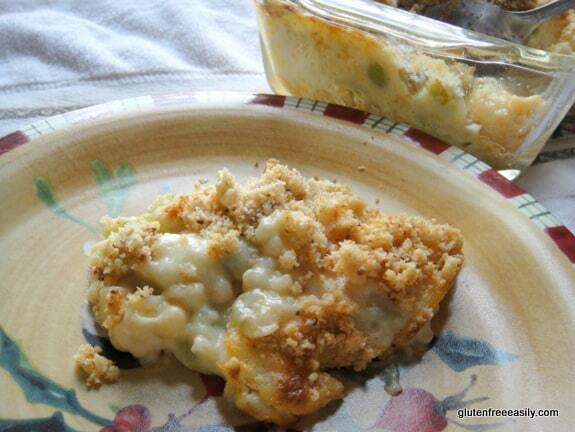 Reminds me of homemade macaroni and cheese or any delicious vegetable gratin. The corn must add a lovely sweetness. I’m going to try it with lima beans! Looks scrumptious!! Definitely will be trying this! Hi Kahri–I sooo appreciate you taking the time to leave such a sweet comment. 🙂 I hope you and your family enjoy it, dear! Sounds great Shirley! You never cease to amaze me! Thanks for listing all of the dairy-free options too! Thank you for the lovely comments on my adoption post. 🙂 I went a little crazy, but it was fun and delicious. This recipe looks wonderful! Can I pleeeeease come to dinner at your house? Please? Sounds so tasty! Ah well, if nothing else I can at least make your recipes at home! Shirley, I have never heard of this recipe, but it sounds yum! Creamy and with that crusty topping, I’m sure it’s a hit!